Tapestry Bag- Gifted Thanks to P.E. Love your look! Glad to hear you had a great valentine's day with your hubby and great picture. Very fab! I have that Jason Wu skirt too! It was my fave of all of his stuff at Target! The tapestry bag is fabulous and your bold blazer is a thing of beauty. Gorgeous, Shana! You really are fabulous. From your hair to your purse and down to your shoes...you sure know how to style. I get so excited when I see bloggers wear vintage items. I wish more people would :) Have a wonderful Wednesday, Shana! 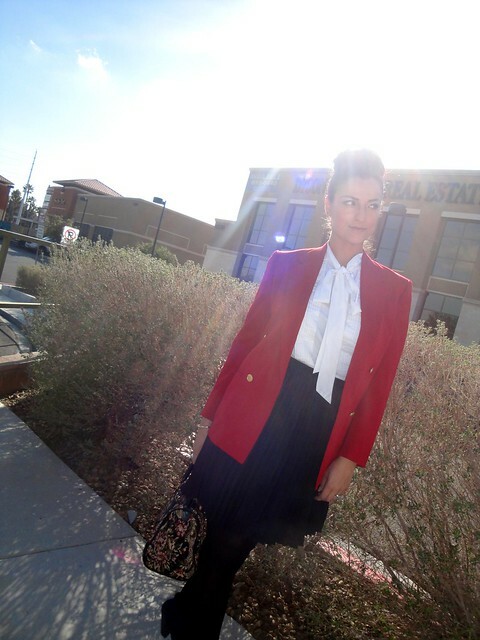 adore the red blazer; i've been looking for a red one for ages! i got something i sort of like in prague, but it is a weird eyelet pattern that is not at all versatile. great pairing with the white blouse! such a classic look. i would have never picked up that bag in a store but now looking at you, I would have totally missed a find. Love how you style everything. Thanks for sharing this nice post.If you are like me very much in love sequin uggs then welcome to your return visit.